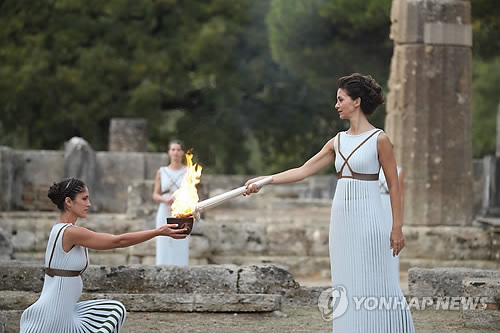 OLYMPIA, Greece, Oct. 24 (Yonhap) — The flame that will burn during the 2018 PyeongChang Winter Games was lit at the birthplace of the ancient Olympics on Tuesday, marking a symbolic start of the torch relay that will involve thousands of people around the globe. With the first Winter Olympics in South Korea 108 days away, the flame for the PyeongChang Games was born at the Temple of Hera in Olympia, Greece, using a backup flame due to rain. It was the first time since the lighting ceremony for the 2000 Sydney Summer Games that a backup flame was used to kindle the Olympic torch. The Olympic flame is traditionally created using a concave mirror to focus the sun’s rays. But with insufficient sunlight due to rainy weather, Greek actress Katerina Lehou, who dressed as a high priestess for the lighting ceremony, had to get the Olympic flame from a small ceramic pot containing a flame from Monday’s rehearsal. The flame-lighting ceremony, which started at noon here, was attended by hundreds of guests including President of the International Olympic Committee (IOC) Thomas Bach, President of the Hellenic Olympic Committee Spyros Capralos and Mayor of Ancient Olympia Euthumios Kotzas. From South Korea, Prime Minister Lee Nak-yon, Korean Sport and Olympic Committee President Lee Kee-heung, and Lee Hee-beom, who leads the PyeongChang Organizing Committee for the 2018 Olympic & Paralympic Winter Games (POCOG), were at the ceremony choreographed by Artemis Ignatiou. 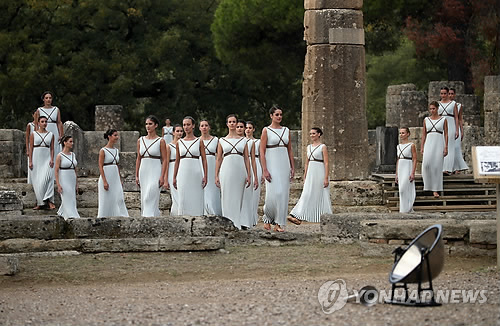 This was the second time that South Koreans have come to Greece for the Olympic flame lighting. South Korea last received the flame before the 1988 Summer Games in Seoul. Lee Hee-beom said the lighting of the Olympic flame marks a “very significant moment” in South Korean history. Bach said the Olympic flame and the Olympic Games will inspire the world again. After securing the flame, the high priestess gave her prayer to the ancient Greek gods and headed to the Ancient Stadium with all priestesses in procession. Following a dance performance on the slope of the stadium, the high priestess then kindled the torch and handed the flame to the first torchbearer, Greek cross-country skier Apostolos Angelis, to start the torch relay. She also gave him a branch of an olive tree while a female dancer released a white pigeon. The leaders of the National Olympic Committees of the upcoming Olympic Summer and Winter Games — Tokyo 2020, Beijing 2024, Paris 2024 and Los Angeles 2028 — were also present when the flame was passed to Angelis. Angelis then transported the torch to the Pierre de Coubertin Monument, where South Korean football icon Park Ji-sung, who also serves as an honorary ambassador for the 2018 PyeongChang Games, was waiting to carry the flame. The IOC said the Olympic flame will take a tour of Greece for the next eight days with some 505 torchbearers covering 2,129 kilometers of Greek soil. 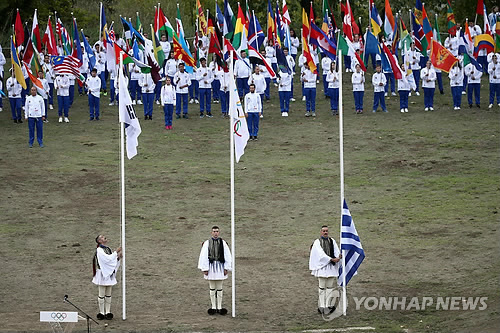 The flame will be officially handed to the PyeongChang organizers at the Panathinaiko Stadium in Athens next Tuesday. After the handover ceremony, the flame will travel 8,500km east to the South Korean port city of Incheon, arriving on Nov. 1 to mark 100 days to the Olympic Games opening ceremony. 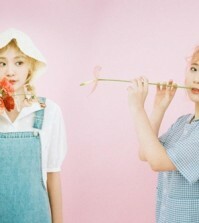 Figure skating prospect Yoo Young will be the first torchbearer on South Korean soil. The POCOG said 7,500 runners will participate in the relay that covers 2,018 km. 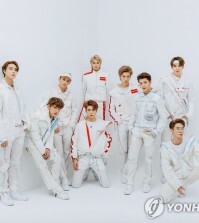 The flame will travel to nine provinces and eight major cities in South Korea before it arrives at the PyeongChang Olympic Stadium for the opening ceremony on Feb. 9, 2018. Wow! Olypic Pyeongchang is about to happen! Wow! Feel so great!